This recipe for caramelized onion and bacon quiche is a perfect Easer brunch recipe! I show you step by step how to make caramelized onions. I am a member of the Collective Bias® Social Fabric® Community. This shop has been compensated as part of a social shopper amplification for Collective Bias and its advertiser. 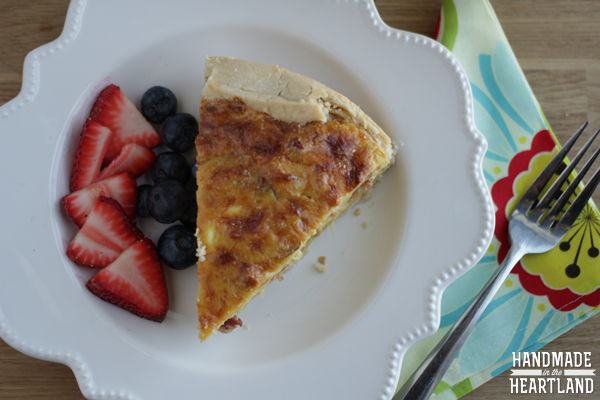 I love to entertain guests and my go to breakfast item for when we have friends or family in town is quiche. I love it because you can always heat the leftovers up the next day for breakfast or brunch and with a few pieces of fruit its a filling meal. For this caramelized onion and bacon quiche I used the new Italian parmesan Kraft fresh take meal kit to add extra flavor. I love that you can easily swap out ingredients for quiche and it always tastes great. For example trade out the bacon for ham or throw in some roasted broccoli florets instead of caramelized onions, honestly you can add whatever you have in your fridge or pantry and everyone will be impressed. 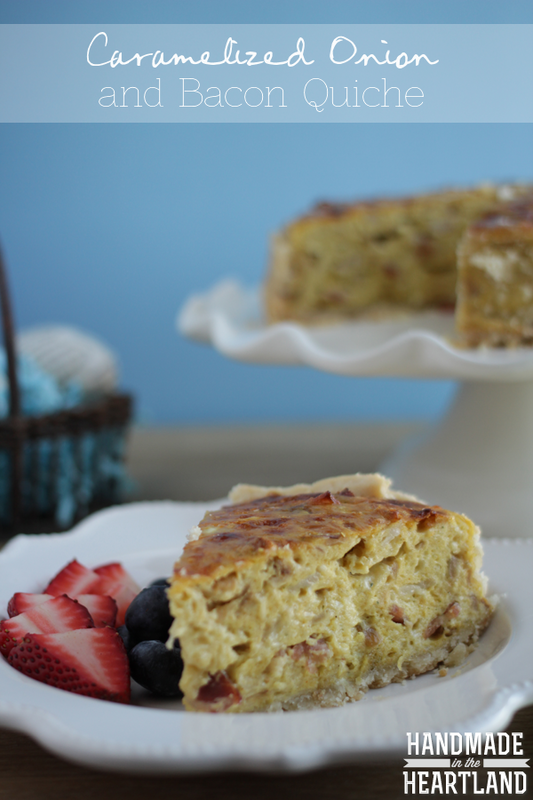 Needless to say if you are blanking on what to make for Easter brunch this quiche will have you covered! 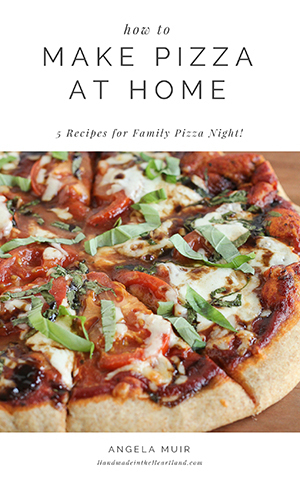 I picked up all the ingredients at Walmart, the fresh take meal kit is in the refrigerated section near the cheese which makes sense since it includes a cheese blend. I chose to use the Italian parmesan blend because the main flavors of garlic, onion, parsley and parmesan complimented the plan I had in my head for my quiche. I did love that I didn’t need to measure out any spices and honestly you could omit the gruyere from the recipe and just use the cheese in the fresh take package. However, more cheese is always a good decision. 1. Preheat your oven to 375. Prep all your ingredients. Cook bacon, shred gruyere and caramelize your onions. 2. How to caramelize onions: Cut the onions in half and then in slices. Heat a large skillet (that has a lid) over medium heat with 2 tablespoons of olive oil, add the onions. Coat the onions in the oil and then cover. Cook for 10 minute increments and then lift the lid to stir and check on them. After about 15-20 minutes reduce the heat to low. You can see the progression of what they are supposed to look like in the photos below, it takes about 45-50 minutes to get them good and brown and caramelized. View the video below to see how to do this! 3. Mix all ingredients together. I like to whisk the eggs first and then add in the other ingredients. 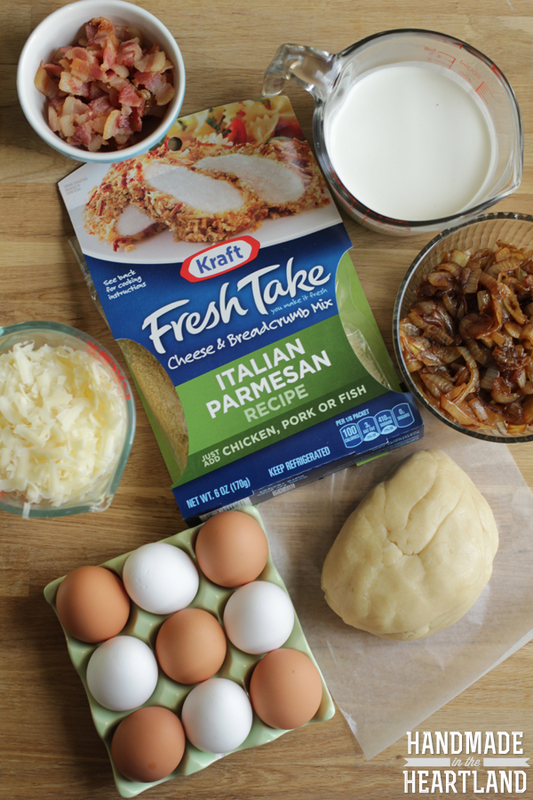 Add both the cheese and spice/crumb mixture in the Kraft Fresh Take package with the eggs, half and half, gruyere, bacon & caramelized onions. Dump into pie crust. 4. Bake at 375 for 45-60 minutes, or until a knife inserted into the center comes out clean. Let cool for 5 minutes and then slice and serve. Enjoy! Watch this video to see how I caramelize onions! What are your plans for Easter? 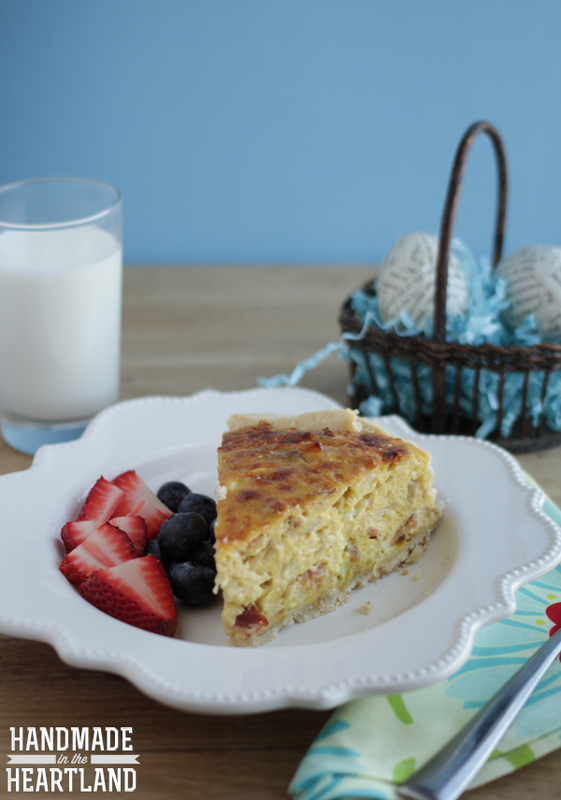 We will be up early (like every other day) excited to see what the Easter bunny has left and eating a delicious breakfast (including this quiche) and then heading off in our Easter outfits to church. Good food is always something to center a celebration around, what is your favorite Easter recipe? I’d love to hear in the comments!